The well- preserved Bridge Gate was built in 1432 on the site of an earlier structure which had served the same purpose. Initially, it was called the Crossing Gate or Ferry Gate as it stood on the route which led to the Vistula ferry crossing point. Its present name is derived from the first bridge across the Vistula in Toruń, which was built in 1500. Although its wooden structure was frequently damaged during the spring thaws and various wars, it served the city and the visitors until the second half of the 19th century when a railway bridge, which is still used today, was built. The Bridge Gate was the most technologically advanced of all the medieval Gates guarding the city from the side of the river. Its rounded walls mitigated the impact of artillery fire and the specially designed loopholes allowed for the use of cannons for the defense of the city. 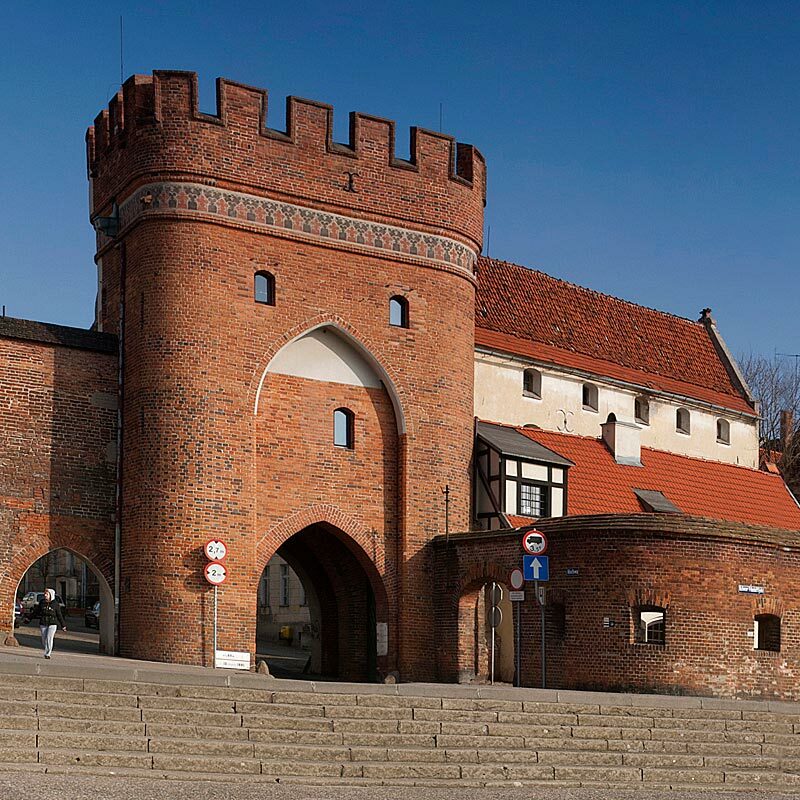 The gate was also the lowest point of the defensive walls of Toruń therefore it was used for marking the level of water in the Vistula river during the highest floods. Although the city was not threatened by flooding as it was situated on an elevation, the water at times reached the Bridge Gate as was the case in the 16th century. Today the information about the record river levels can be seen on the metal plaques mounted on the gate. On the other side of the Vistula one can clearly see the lush green of the river islet called the Market Grove (Kępa Bazarowa). It was on that island that the First Peace Treaty of Toruń was signed in 1411, which ended the war between Poland, Lithuania and the Teutonic Knights Order. It was also to that island that the harlots from Toruń were banished in a display that served both as a warning and entertainment. The sinful women, clad in straw garlands were seated on donkeys, facing the beasts’ rear, and driven, with the use of a hangman’s whip, onto the island, which has since been referred to as the "Monkey Grove". Today, the site on the river bank where the old wooden bridge used to stand serves as a viewing point. The panorama of the Toruń Old Town that can be admired from there was voted in 2007 one of the seven wonders of Poland.